What a Way to Start! Fried Okra $3.99 – great with Ranch dressing! Buffalo Chicken Tenders – Served mild or hot with bleu cheese dressing and celery. Our Pork, Beef & Turkey Sandwiches are served on garlic bread, all other sandwiches are served on a jumbo bun. Cheese 50¢ extra. All sandwiches are served with fries. The Rib City® Steakburger $8.29 – A fresh, hand-patted 8-ounce burger, grilled to your order with lettuce, tomato and onion. Grilled Chicken Sandwich $8.29 – A fresh chicken breast brushed with our sweet sauce then grilled. Served with lettuce and tomato. Served with garlic bread, and choice of any two: fries, cole slaw, baked potato, applesauce, baked beans, corn on the cob, Southern green beans or sliced tomatoes. With garlic bread & choice of 2: fries, cole slaw, baked potato, applesauce, baked beans, corn on the cob, Southern green beans or sliced tomatoes. Bar-B-Q Chicken Dinner $10.99 – A tender 1/2 chicken, slow cooked over our wood fires and basted with our sweet sauce. All White Meat add $1.00. Rib City® Riblet Dinner $11.29 – Delicious and tender, these rib tips are basted with our sweet barbecue sauce. St. Louis Style Ribs $14.49 – If you like traditional Spare Ribs, you’ll love these closely trimmed ribs. Something you can sink your teeth into! Bar-B-Q Pork Dinner $10.49 – Slowly cooked to perfection over Blackjack oak, sliced thin & piled high. Rib City® Pulled Pork Dinner $10.49 – Smoked on site, pulled and mixed with our Rib City® Tangy sauce and unique spices. Bar-B-Q Beef Dinner $10.69 – Wood smoked Beef Eye Round, sliced thin and piled high. Smoked Turkey Dinner $10.49 – Boneless breast of Turkey sliced thin, served moist and tender. Rib City Sirloin Steak $15.99 – A Great steak, lightly seasoned and grilled to your order. Rib & Rib Combo $17.99 – A combination of Baby Back Ribs & our St. Louis Ribs – together on one plate! Tony’s Combo $17.99 – Full Rack of Baby Back Ribs and your choice of one: 1/4 Chicken or 1/4 pound of Beef or 1/4 pound of Pork or 1/4 pound of Pulled Pork. Fried Shrimp $13.99 – Jumbo Gulf shrimp butterflied and breaded by hand in our kitchen daily, then fried to perfection! Shrimp and Ribs $14.99 – 1/2 Rack of Baby Back Ribs and our delicious Jumbo Fried Shrimp. Feast for Two $34.99 – Smoked Pork, Beef, 1/2 Chicken, Full Rack of Baby Back Ribs, 2 potatoes, 2 baked beans, 2 cole slaw & 2 garlic bread. Served daily from 11 am – 4 pm and include fries, garlic bread and cole slaw or baked beans. Bar-B-Q Pork Plate $8.49 – Smoked until moist and tender, sliced thin. Bar-B-Q Beef Plate $8.49 – Wood smoked Beef Eye Round, sliced thin and piled high. Bar-B-Q Chicken Plate $8.49 – 1/4 Chicken basted in our sweet barbecue sauce. Smoked Turkey Breast Plate $8.49 – You’ll love this Rib City favorite sliced thin. Baby Back Rib Plate $9.29 – 1/2 Rack, so tender the meat just falls off the bone. 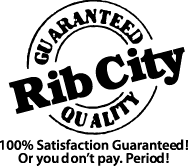 Rib City® Riblets Lunch $8.89 – Tender rib tips basted with our sweet barbecue sauce. Bar-B-Q Chicken & Pork or Beef $9.69 – 1/4 chicken and tender pork or beef – your choice! Fried Chicken Tender Basket $8.89 – Chicken breast tenders fried to perfection. Beans and Franks (The Gas Station) $7.29 – Two 1/4 pound all beef hot dogs smothered in our baked beans. Grilled Chicken Breast $8.89 – Brushed with our sweet sauce and grilled to perfection. Housemade Dressings – Bleu Cheese, Ranch, Thousand Island, Honey Mustard or Italian. Smoked Turkey Deluxe $8.29 – Our fresh garden salad topped with tender turkey, served with your choice of housemade dressing. Smoked Beef Salad $8.49 – Our fresh garden salad topped with our wood smoked Beef Eye Round. Chicken on the Greens $8.89 – Our fresh garden salad topped with a grilled, sliced chicken breast. Bar-B-Q Chicken & Salad $6.99 – 1/4 Chicken basted with our sweet sauce and a house garden salad, your choice of dressing. The Rib City® Club $9.89 – Our fresh garden salad topped with sliced smoked turkey, our shredded three cheese blend & real bacon bits. Buffalo Chicken Salad $9.49 – Our fresh garden salad topped with lightly breaded chicken tenders tossed in mild or hot Buffalo sauce. Chocolate, Chocolate Mania $4.95 – Thick chocolate fudge in a chocolate cookie crust topped with more chocolate! Raspberry Swirl Cheesecake $4.25 – Rich white chocolate cheesecake swirled with red raspberry. Coconut Cream Pie $3.95 – Homemade Coconut Cream Pie topped with whipped cream and toasted coconut. Key Lime Pie $3.95 – A tart and tangy Florida tradition. Southern Pecan Pie $3.95 – Baked fresh daily in our kitchen with a recipe straight from Grandma. Under 4 years-old your Kids Meal is on us! – One piece of chicken and fries – Dine In Only. Kids Meals for 10 years & younger only. Each meal is served with a Kids Drink and choice of two: French Fries, Corn Cobbette, Applesauce, Southern Green Beans or Mandarin Oranges. Lil Ribber Basket $6.99 – fall off the bone Baby Back Ribs! Bar-B-Q Chicken $3.99 – 1/4 smoked & barbecued Chicken. Mini Corn Doggies $3.99 – Mini dogs, dipped and deep fried. Lil Shrimper Basket $4.29 – Crunchy fried Shrimp. Dinosaur Nuggets $3.99 – Breaded chicken nuggets in Dino shapes. Say “Cheese” Sandwich $3.99 – Buttered Texas toast grilled cheese goodness. © Rib City - All Rights Reserved.